After turning professional with two stoppages in June of 1996 Ran Nakash came to the legendary Blue Horizon in North Philadelphia by legendary matchmaker Don Elbaum. His trainer was Ran Taal. The Jewish Cruiserweight from Haifa, Israel, would return nine more times to the same location. Fourteen of his twenty-seven bouts were in the United States. He had two in Germany and one in Bulgaria. He retired at the age of 33 and is currently 39 with his next birthday on July 3rd will be the big “40”. Nakash’s record was 26-1 with 18 knockouts. 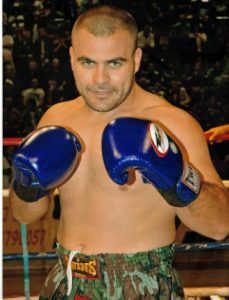 In his twelfth bout with only one 8 rounder under his belt he won a 12 round decision over Croatia’s Asmir Vojinovic, 28-8-1, at the Aviv Sports Hall in Ra’anana, Israel on March 01, 2008, stopping his opponent in 7 rounds. Nakash would go back and forth fighting at the Blue Horizon and Israel. In July of 2008 he made his first journey to Germany scoring a knockout over a novice. Then back to the US scoring four straight knockout wins. Then to Newark, NJ, on the undercard of IBF Cruiserweight champion Tomasz Adamek defending and defeating Bobby Gunn. A show J Russell Peltz was the matchmaker for Main Events where Nakash scored another stoppage. In October of 2009 Nakash was back at the Blue Horizon defeating Gary “Pit Bull” Gomez, 18-10-1, of Salt Lake City, UT, who in his previous fight was stopped in 7 by the same Tomasz Adamek. Nakash took a solid 8 round decision win. It would be his last appearance at the Blue. In April of 2010 Nakash would travel to Norfolk, VA, and stop Richie Stewart, 14-8-2, brother of Mike “No Joke” Stewart, in 7 rounds. In July he was winning a 10 round decision over Victor Barragan, 11-5, at the South Philly Arena. Two fights prior to this Barragan defeated Arthur Williams the former IBF Cruiserweight champion for the interim WBC Cruiserweight (USNBC) title. Nakash was now 25-0 and a high ranking contender and was given the opportunity to fight for the title against WBO Cruiserweight Champion Marco Huck, 31-1 (23), at the Gerry Weber Stadium, in Halle, Germany. Huck’s only lost was to Philadelphia’s Steve “USS” Cunningham back in 2007. For a Jew to fight in Germany against a German was a big deal. It would be Huck’s sixth title defense. One of those defenses was a split decision win over the now current WBA Cruiserweight champion Russian Denis Lebedev. After that defeat in Lebedev’s next to fights he defeated Roy Jones, Jr. and James “Lights Out” Toney. In 2012 he won the WBA World title. Nakash would be filling in on short notice for Italy’s Giacobbe Fragomeni who pulled out of the fight. The judges were from Sweden and two from the US with US referee Joe Cortez. The taller Huck by 4” used his jab to perfection against the always coming forward Nakash to take the fight by decision over 12 rounds. It would be seven months before Nakash would fight again as it turned out his last bout of his career. He took on Philadelphia’s southpaw Derek “One Man Riot” Bryant, 20-6-1, at the Roseland Ballroom, in New York City on the undercard of a NABF title bout featuring DeMarcus Corley defeated previously unbeaten Gabriel Bracero. From 2002 to 2007 Nakash would become Chief Commander and Head Instructor of the Israel Defense Forces Krav Maga Instructional Division. He has two large Biblical inscriptions tatooed on his body. One is “Hear oh Israel, the Lord, our God, is one” on his neck. The other “Though I walk through the valley of the shadow of death I fear no evil, for ”You are with me” across his arms. “We brought him over here. He had a reputation in Israel for Krav Maga and killed Palestine soldiers by breaking their necks when he went behind the lines. I thought he was going to be world champion. A Jew hadn’t fought in Germany since World War II when we brought him there in 2008. When he hit you I thought he would knock you dead. He trained at Front Street Gym in Philly when he was here,” said Don Elbaum. “I had the pleasure of refereeing four bouts involving Ron Nakash. Ron won those bouts by KO or TKO. He fought hard, he fought clean and he was always well prepared. My personal “highlight” involving Ron occurred on April 29, 2010 when he KO’d Dan Sheehan at the Nokia Hall in Tel Aviv, Israel. It was the one and only time I refereed in Israel and it was a wonderful experience,” said IBHOF referee Steve Smoger. Nakash first started training when he father enrolled him in a Thai Boxing Program at the age of 10. He eventually became accomplished in a variety of martial arts including kick boxing, Muah-Thai and Karate. He runs the Nakash Boxing Gym Physical Fitness Center & Sports Club.